Snipes himself is… ok, I guess. He looks absolutely ridiculous, but other than that, it isn’t an offensively horrible portrayal. It’s mediocre at best, and seems more like he might have been phoning it in for a much needed paycheck (just like Blade: Trinity, the unloved black sheep of the otherwise amazing Blade franchise). But that paycheck couldn’t stop Snipes from going to prison, and holding everything up. If the movie had anything at all going for it, it is a certain sense of style that fits in with the ridiculous story. Red leather dusters, bleached blond hair, and crosses absolutely everywhere. It keeps the set from being painfully generic, even as it leaches from the annals of the Western. It wants to be Sergio Leone, but it is far from that pedigree. At least they tried for something more, even if they didn’t manage to achieve it. It is an unintentionally funny movie, but I’d be hard-pressed to call it anywhere near good. 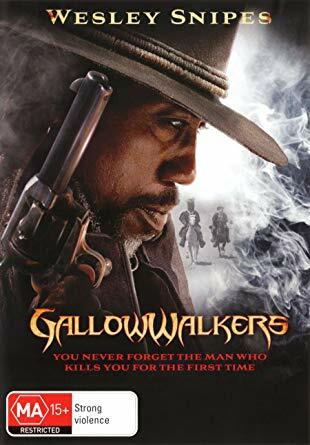 There is something about a cowboy Wesley Snipes that is inherently ridiculous (maybe it’s the bleached blonde goatee, but who knows) that stops me from taking him seriously. And that’s kinda the way I feel about the entire movie. Confused, weird, and ridiculous. But it’s cool when he shoots people I guess.